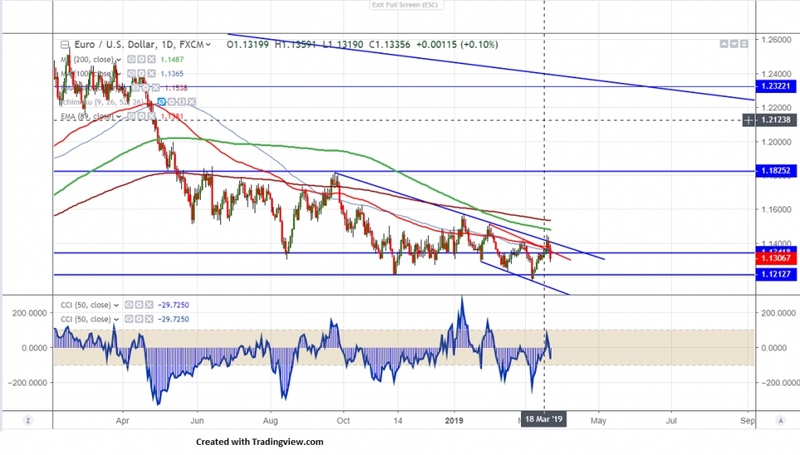 EURUSD was trading higher after dovish Fed and jumped till 1.14482 on Mar 20th 2019. The pair pared its gain after release of French and German PMI data. German flash manufacturing PMI came at 44.7 in Feb compared to forecast of 48 and services PMI came slightly above expectations at 54.9 vs estimate of 54.8. The pair lost nearly 100 pips and hits intraday low of 1.12883 and is currently trading around 1.13069. Yesterday US jobless claims and Philly Fed manufacturing data came better thane expected also supported US dollar. The major support is around 1.126700 and any break below will drag the pair till 1.1230/1.1215. Any violation below 1.1215 targets 1.11760. On the higher side, 1.1354 (50- day MA) and any break above will take the pair to next level till 1.1400/1.14500/1.1500. Any break above will take the EURUSD till 1.1520/1.15689. It is good to sell on rallies around 1.1335-40 with SL around 1.1370 for the TP of 1.1230/1.12150.